Jake’ Wayback serves a “Triple Triple” which is basically three triple cheeseburgers stuck together. Does that sound too much? Well, became the 227th person to order one at the Bel Air restaurant. THIS THING WAS THE SIZE OF DAD’S HEAD! Although I was hoping it was going to be bigger. I had a single slice of lettuce and a single slice of tomato (salad!) and a large order of fries. My awesome Triple Triple burger. The Triple Triple was awesome in size, but I think you need to add more toppings to make the flavor interesting all the way through. I would choose grilled onions and Jake’s chipolte mayo. It also needed more lettuce and tomato. Honestly, it was bit bland with just a pile of meat and cheese. But I was still number 227! It’s official! I ate the 227th “Triple Triple” at Jake’s Wayback Burgers! I would award this burger a score of 5 out of 10. It was a great size, but it was a bit bland. I think next time I’ll order three separate triple burgers (extra buns, extra toppings) and invent that as my own challenge. We recently had a family gathering at Iron Hill Brewery & Restaurant in Wilmington, Delaware. A whole bunch of cousins! I had the Mexicali Burger with pico de gallo, pickled jalapeños, pepper jack cheese & chipotle thousand island dressing. The jalapeños weren’t really that spicy and they didn’t take away from the falvor of the burger patty. (I think it would be a good idea to have a “jalapeño challenge” where you can have extra peppers.) The pico de gallo made a nice change instead of ordinary tomato and onion. I liked the chipotle thousand island dressing because it had a tang and I could dip my fries into it. It cost $12.50. I think this is a little too much. It was worth $10.50, but $12.50 is a stretch. Overall I award this burger 6 ½ points out of 10. That’s at the top end of average. I would give it another ½ point if it was better value for money. It was a cold but sunny day (no snow, for a change!) and we took a road trip to Burger Bros. in Towson, MD. It’s located on Allegheny Avenue and you can easily walk there from Trader Joe’s or Barnes & Noble. Yeah… we went to Trader Joe’s, but the main reason we were in Towson was for the burgers. Burger Bros., 14 Allegheny Avenue, Towson, MD. I ordered a cheeseburger (I chose pepperjack cheese) with basic lettuce & tomato fixins’. The burger patties are 6 oz Angus beef, char grilled to order. They have a lot of flavor and good meaty juices. It was one of the best burger patties I have tasted in a while. Cheeseburger (pepperjack cheese) from Burger Bros., Towson, MD. Strawberry milkshake from Burger Bros., Towson, MD. Burger Bros. is a family business (run by brothers!) and they seem to be proud that they’re not another Five Guys franchise. You can ever buy a t-shirt. 4 Out of 5 Guys Choose Burger Bros. I award my burger a score of 8 out 10. It was a good, juicy burger. If you are visiting Towson, and whether you have an official Trader Joe’s hipster beard or not, then you should pay Burger Bros. a visit. School was cancelled because of a “weather emergency” so I spent the morning at home studying for exams (only joking!) and tidying my room (seriously joking!). The ice storm turned into rain by midday so Dad drove me into Bel Air for a burger. We went to the Bel Air branch of Jake’s Wayback Burgers which I’ve been to several times before and enjoy very much. I ordered the Brisket Burger which was last month’s (December 2013) “burger of the month.” If you ask really nicely then they’ll still make them for you. Dad says it doesn’t count as a secret menu. He says it’s just because they’re nice folks and I ask politely. 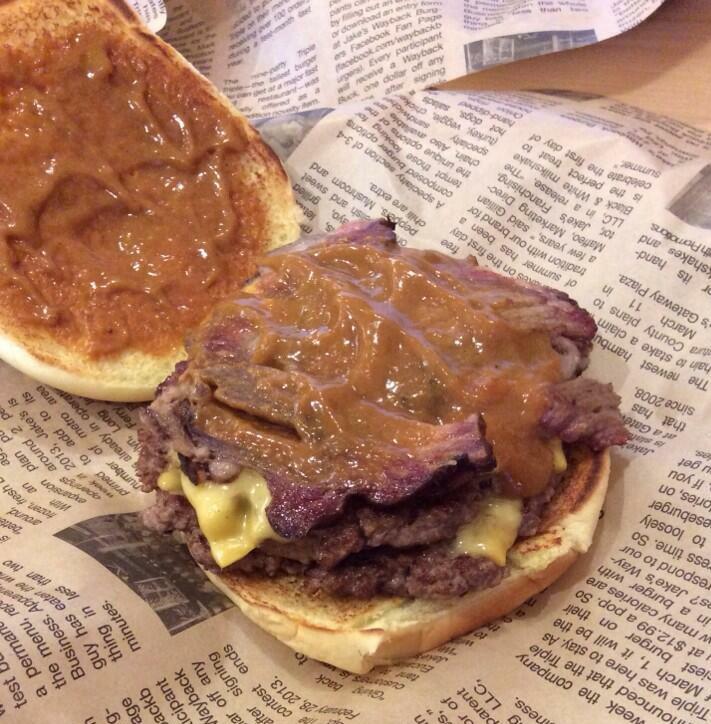 The Brisket Burger has two beef patties, American cheese, slices of smoked brisket, and Wayback Gold Sauce. The “gold sauce” tasted like a smokey mustard barbecue. It was a nice zesty topping. The slices of brisket were also smokey, like a barbecue brisket, not like the brisket my parents cook for Rosh Hashanah. (Dad just that’s a braised brisket, not a BBQ brisket, so know we all know!) The burger patties were nice and juicy, just like you can always rely on at Jake’s. Mon and Dad wanted to go out for lunch so we drove up to Havre de Grace to eat at the Tidewater Grille where we’d have a view of the Susquehanna River (the Susquehanna doesn’t meet the Chesapeake Bay until Concord Point light house and Tidewater is upriver of that nearer the railroad bridges). Mom and Dad were obviously going to order something fishy (Tidewater is famous for its seafood dishes), but I wanted their Steak Burger. 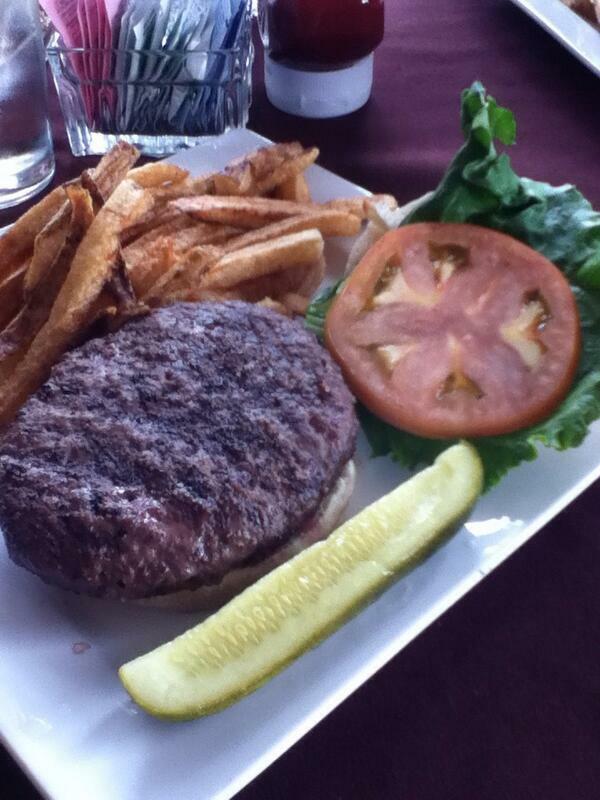 ‘Steak Burger’ from Tidewater Grille, Havre de Grace, Maryland. I am pretty sure that the patty was a Bubba-style burger. It tasted mealy, like it had ground cereal in it. The Tidewater menu only says “half pound burger” and doesn’t mention fresh or hand formed patty. There wasn’t much much and it had a plain flavor. I can only award this burger a score of 4 out of 10. In my scoring system 4 to 6 is average. So this 4 is a low average. Mom and Dad enjoyed their fish. My recommendation is to order fish at Tidewater Grille. That’s what they’re famous for. I was holiday shopping with Dad (what do you buy for Mom?) and we stopped at Chili’s for lunch. I ordered their Southern Smokehouse Burger. It has “four slices of applewood smoked bacon, hickory-smoked cheddar cheese, ancho-chile BBQ sauce, mayo & freshly made crispy onion strings.” As you can see from the photo it is a monster! The burger was HUGE. Dad told me to look up the nutrition info when I got home. So here’s the Chili’s nutritional menu. The Southern Smokehouse Burger is 1610 calories and 96 grams of fat. The fries add another 410 calories and 17 grams of fat. The first bite of this giant had so much flavor. 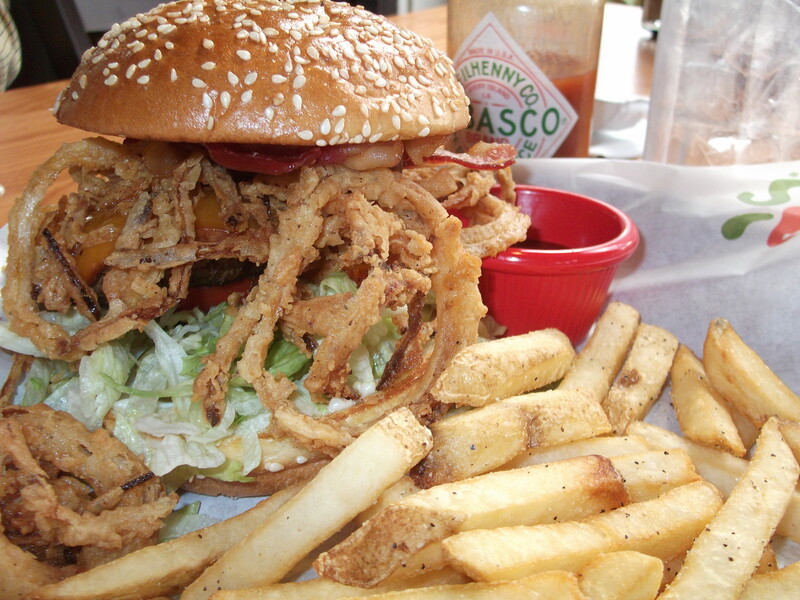 The onion straws were nice and crispy and it complemented the barbecue sauce. The four slices bacon were crunchy, which I enjoyed. The burger patty itself wasn’t half bad. It wasn’t frozen and it had a dash of salt and pepper, not enough to overpower anything else. I HAD MAYONNAISE! You may be asking why I committed such a stupid act. Well, from the amount of flavors in the burger, I couldn’t taste it at all. I give this burger a 8 out of 10. It is a great burger for somebody who has been starving since breakfast but not the best burger for somebody who needs a light snack. We stopped at Ruby Tuesday for lunch and I ordered one of their new pretzel burgers. I think it’s just their old burger, but on a pretzel roll instead of a bun. Dad says they only renamed it because that way they can charge a dollar more. I don’t know about that, but I think the pretzel roll does make it tastier. I ordered the ‘Bacon Cheese Pretzel Burger’ which is described on the menu as “fresh 100% USDA choice beef” (Phew! Thank goodness it’s not 99%!) served with “applewood smoked bacon, melted cheddar cheese, and bacon mustard mayonnaise.” I was not sure about the bacon mustard mayonnaise. You know what I think about mayonnaise on burgers. But Dad said I should try it and describe it in the review. Ruby Tuesday Bacon Cheese Pretzel Burger. The burger patty was OK. Ruby Tuesday make a good basic burger patty patty. For a casual dining chain restaurant it is fine. The bacon was so-so. I like the bacon on my burger to be thick and crispy. This was good, but it needed to be thicker. The pretzel roll was nice a chewy like a Philadelphia soft pretzel. 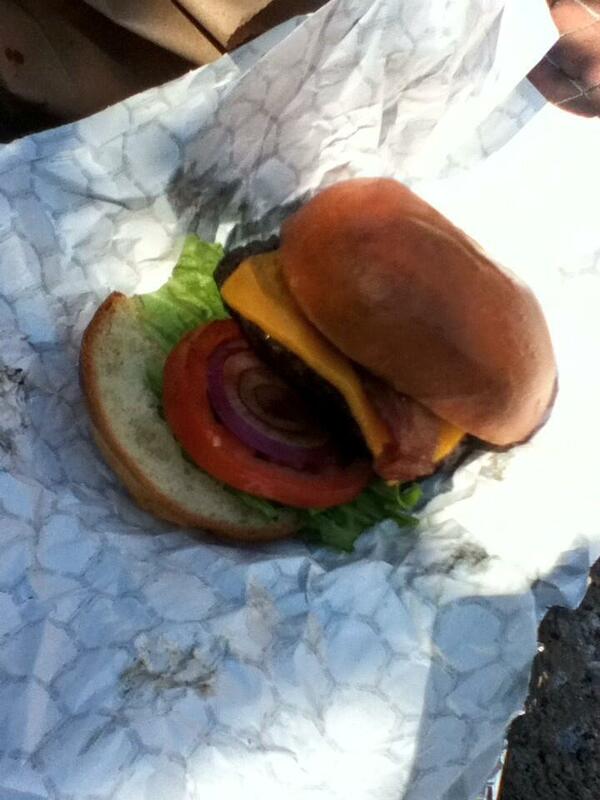 It was a nice change to have a pretzel roll instead of an ordinary burger bun. The cheese was basic American slices. That’s OK. American cheese melts easily on burgers. The bacon mustard mayonnaise was not my favorite thing. There was too much of it. I am glad that I was brave enough to try it, but I would not order it again. I might try the ‘Spicy Jalapeño Pretzel Cheeseburger’ instead. I award this burger a score of 6.5 out of 10. My last Ruby Tuesday review was a 6 out of 10. The pretzel roll makes 0.5 points of improvement.